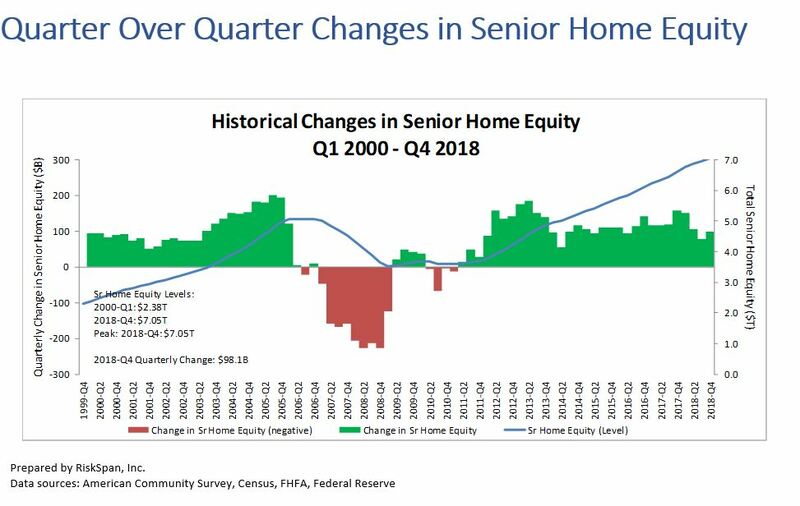 Homeowners 62 and older saw their housing wealth grow by 1.4 percent or $98 billion in the fourth quarter to a record $7.05 trillion from Q3 2018, the National Reverse Mortgage Lenders Association reported today in its quarterly release of the NRMLA/RiskSpan Reverse Mortgage Market Index. The RMMI rose in Q4 2018 to 254.10, another all-time high since the index was first published in 2000. The increase in senior homeowner’s wealth was mainly driven by an estimated 1.3 percent or $110 billion increase in senior home values and offset by a 0.7 percent or $11.7 billion increase of senior-held mortgage debt. Year-over-year, the RMMI increased by 6.5 percent in 2018, compared to 8.4 percent in 2017 and 8.2 percent in 2016. The slowdown in the rate of growth in the RMMI can be attributed to lower home price appreciate rates nationwide.